A vaporizer is a healthy substitute for smoking that prevents inhaling of toxic products. A person can breathe in the active ingredients of plant material such as tobacco, cannabis, etc., through this device. In the process of vaporization, blends are heated on a much lower temperature, in order to extract the complete zest and purity of a plant material. Through the tiny shallow puffs, one can gain several therapeutic effects. Therefore, vaporizers are really valuable. Nowadays, vaping has become a trend. If you are also a vaping freak, you might have to shell out a pretty good amount. However, you can also prepare homemade vaporizer without making a dent in your wallet. Apart from saving money, it is less harmful to your throat and also provides you a joyous feeling. The light bulb vaporizer is the most popular one. It is very cost-effective and can be made easily at your place. The guidelines for preparing a vaporizer are given below. Step 1 – First of all, take a 100 watt light bulb and cut the metal cap very carefully with a knife. Step 2 – Now remove all the filaments and debris inside the bulb by using pliers. Clean the bulb properly. Take some water and add salt to it. Wash the bulb’s interior with it. Remove all the dust particles and scrape all the paint spots as they may have harmful chemicals which are injurious if inhaled. Later, leave it until it dries. Step 3 – Put the light bulb aside and unscrew the bottle cap. Check first whether it fits on the metal part of the bulb. It’s alright if the size is bigger. Take a knife and make 2 straw-sized holes in the cap. Step 4 – Put the herbs inside the light bulb and screw on the bottle’s cap at the top of a bulb. Use tape to fix the cap properly. Step 5 – Now, insert two straws into the hole of the cap. Trim their size by using scissors. 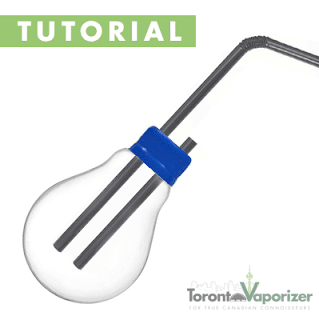 Step 6 – Finally, the homemade vaporizer is ready to use. Burn a candle or lighter, and provide constant and steady flare from the bottom of the light bulb. This will vaporize the herbs. You can rotate the lighter/candle in small circular motions. The herbs create oil when heated between 250° and 400° F. It contains active ingredients; hence, you can inhale by using one of the straws. Breathe in very slowly. You will feel the taste gradually.